I was asked to make sure I have a bread substitute for this Shabbat for someone eating here who has recently gone gluten free and is not so happy about it. 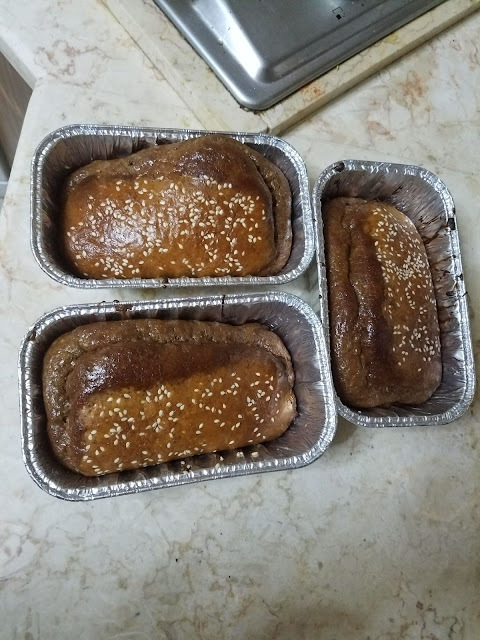 So I thought back to that Techina Bread that made the rounds one Pesach in the not-so-distant past, and that I had made using cashew butter for Pesach (as we are not kitniyot eaters). I remembered it being slightly more cake-like than bread-like, so I decided to tweak it a bit. No, this is not a real bread that you can make "hamotzi" on, but I think anyone who really cannot eat gluten doesn't need to make hamotzi, so it's ok (that's my understanding, but I'm not giving you a halachic psak - check with your halachic authority). The Techina bread recipe calls for eggs, techina, honey, and baking soda. That's it! Hoping to make it a bit more like a hearty, whole grain bread, I changed things up a bit. Mix together eggs, techina, silan, salt, and baking soda - mix well with a whisk until thoroughly combined and batter thickens slightly. Fold in seeds. - and sprinkle extra sesame seeds on top (optional). Bake 25-35 min at 180 C (about 360 degrees F) It turned a rich golden-brown color, and resembles a whole grain bread (at least that!)! Hoping it goes over well! I nibbled one and it's definitely less cake-like than my last experiment! I liked it! Hoping my picky "customer" enjoys it too! Do the flaxseeds need to be whole, or can they be ground? Thanks! I've done it both ways. I think you get more benefit healthwise from ground ones, though, enjoy! I make this, but with a lot more seeds! I've done it with ground seeds and with whole. It comes out great either way. I mix the seeds together before adding to the batter, and reserve a tbsp or so of the mixture for sprinkling on top. It's not hamotzi, but it's a great bread recipe. It's great spread with hummus or chopped liver, or pb&j! !